Yorkville Branch welcomes WorldPride with giant rainbows. WHEN: Wednesday, June 18, 2:30 p.m.
WHAT: Rainbow-wrapped columns in honour of WorldPride, which officially kicks off tomorrow. 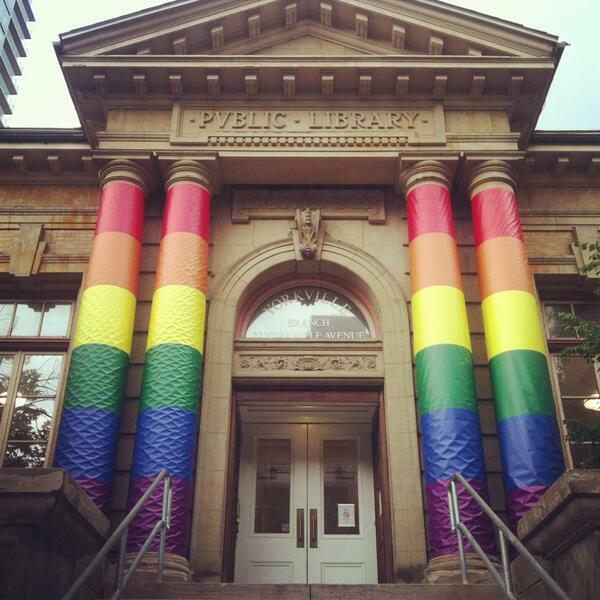 The branch, home to the TPL’s LGBT collection, was given this celebratory makeover by the Toronto Public Library Pride Alliance, a employee resource group run by volunteers (which will also be organizing the library staff appearance at the upcoming Pride parade). Patrons will be greeted by this burst of colour throughout the month of June, and are also invited to attend one or all of the raft of events being held at branches across the city in honour of Pride.